Join TMT at the Journey through the Universe 10th anniversary celebration in association with ‘Imiloa Astronomy Center’s 8th annual Family Science Day on Sunday, March 9, 2014. This celebration is free to the community and the first 500 keiki (kids) visitors will receive a free gift. Enjoy activity booths, out-of-this world astronomy presentations, and much more. TMT scientists Ann Marie Cody and Breann Sitarski will have a featured presentation at 1pm titled “Planets: Near and Far.” Did you know that our solar system is not alone? Over 1000 planets have now been identified around other stars, and many possess unique properties. Finding and characterizing these planets has been a triumph of modern astronomy. In this presentation, you will take an interactive journey starting with the Earth and Moon and ending in solar systems other than our own to explore these discoveries and the size scales involved. During the week of March 10-14, astronomy educators also will be visiting classrooms in and around Hilo, giving hands-on, interactive presentations to the students, and inspiring careers in astronomy and astronomy-related fields. Cody, Sitarski and TMT scientist Gordon Squires will be at a number of middle school classrooms throughout Journey week. 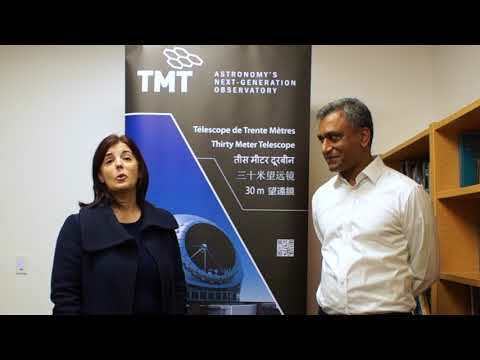 Journey through the Universe has visited over 50,000 students in over 3,000 classrooms over the past ten years thanks to a strong partnership between the Department of Education and the Hilo astronomical and business communities. Originally developed over fifteen years ago by the National Center for Earth and Space Science Education (NCESSE), Journey through the Universe is a national science education initiative. The program engages entire communities – students, teachers, families, and the public – using Earth and space sciences and space exploration to inspire and educate. The initiative supports sustained Science, Technology, Engineering, and Mathematics (STEM) education in local schools, and is a celebration of exploration and the joy of learning. The Journey initiative includes workshops for teachers that include grade K-12 lessons and curriculum support materials with ongoing support in science content and pedagogy. The communities integrate these resources into their existing STEM education programs in both formal and informal science education venues. The result of this partnership reflects the strengths and capabilities of the entire community.